One helluva satisfying rock show Saturday night, as Arctic Monkeys and The Spinto Band put a lot of smiles on folks’ faces with their music. The Spinto Band came out crackling, with a lot more energy than I expected from only hearing their great pop song “Oh Mandy”. They jumped, bounced and got the crowd moving right from the first couple of songs, and showed a strong stage presence at Webster Hall. I bought the CD from their merch table at gig’s end, and hope to dip into it a lot more this week. Arctic Monkeys came out and rocked the place. There was a DVD shoot happening, so we had the camera guy in front of us on stage right, a bit annoying at times. But certainly not as annoying to us as the Brit lager louts singing Sheffield FC anthems probably were to the band. Singer Alex Turner seemed a bit tired at times, but his guitar playing and vocals were still ace. Drummer Matt Helders and bassist Andy Nicholson kept the whole thing riveting, bass and drums lockstep in time oh yeah. 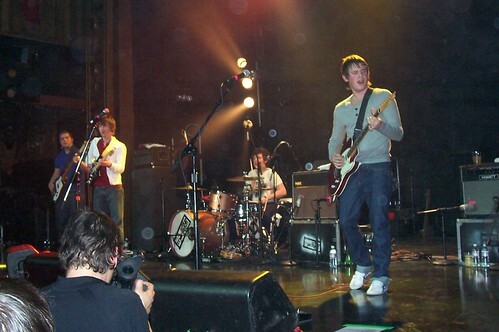 I was on guitarist Jamie Cook’s side so got an eyeful of his rockin’ playing. Highlights included “When the Sun Goes Down” (the whole crowd singing “they say he changes when the sun goes down”), “Fake Tales of San Francisco” and “Vampires is a Bit Strong.” And someone help me out? Did they play the opener twice? And wasn’t Vampire done twice? 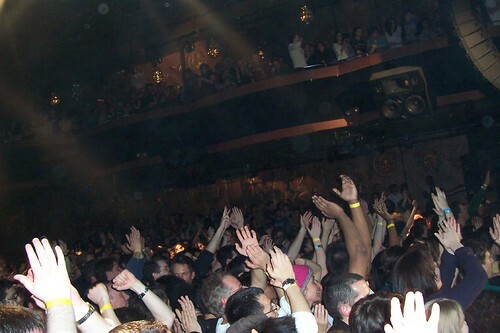 Or was I hallucinating from the bouncy Webster Hall floor? Certainly the motion contributed to my bouncy pictures, sadly. 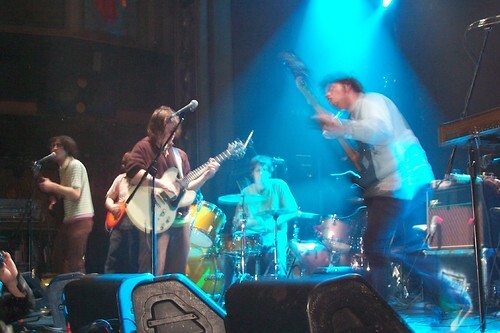 See the rest of my pix of The Spinto Band and Arctic Monkeys at my Flickr site.